On Wednesday, January 16, Fillmore Central FFA members competed in the District 5 Leadership Development Events in York. 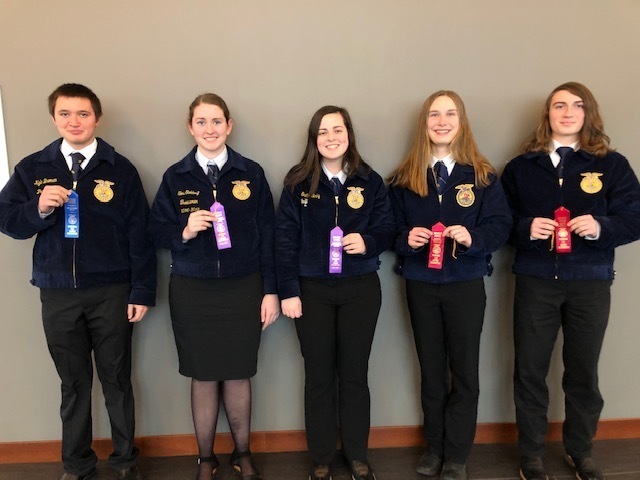 Pictures left to right: Kyle Broman received a blue in Employment Skills; Tori Stoldorf received a purple in Employment Skills; Sadie Birky received a second place purple and qualified for state in Junior Public Speaking; Kaylynn Sieber received a red in Natural Resources Speaking; and Dakota Nun received a red in Junior Public Speaking. Avis Koca and Abbi Smith assisted Mr. VanDeWalle with facilitating the Senior Public Speaking by serving as the timer and door watcher.